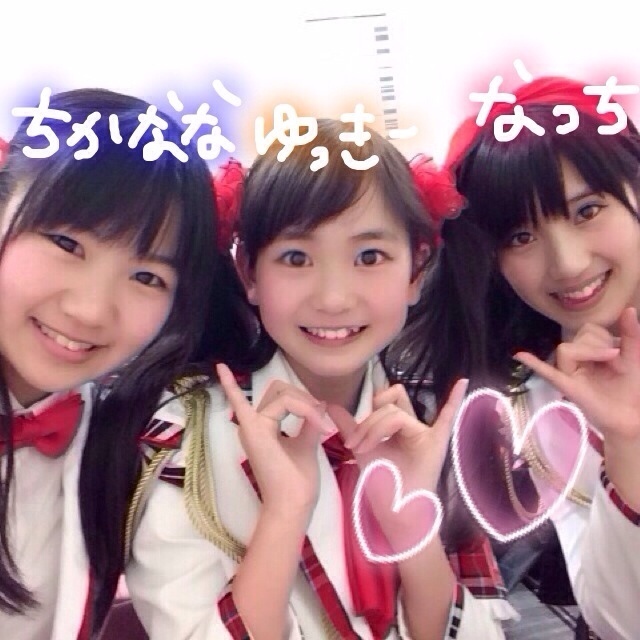 Discussion in 'The STAGE48 Idol Emporium' started by mayuoshi, Dec 18, 2013. In Japan, one idol from Fukuoka is making a storm all over the Japanese internet. In early November, her name became the most searched term in Japan. Who is this wonder idol? Her name is Hashimoto Kanna. She is part of the local Fukuoka group Rev. from DVL, who perform at local events in Fukuoka. She's very popular on 2chan and Twitter and is being called a "Once-in-a-thousand-year talent". I think that she's pretty cute and even if she isn't "once-in-a-thousand-years" she deserves the support. This is the picture that made her famous. She got the cover of Anan, so I punch a search and was brought here! Such exaggerated title! But she does have the 'presence' and the necessarily perceive idol 'character'. Why is she not in HKT!? Her beauty is out of this world. It would do her good to audition for HKT, not only will she definitely be taken and will be made something, but she might take the center spot on a whim. She's like a dough with all ingredients perfected waiting to be baked and I don't think she'll shine much in her current group. But this kind of thing happens with indie idols. Sometimes one or two members stand out too much because they are "too good" for their own local group. It's harsh to say that she should leave her group, but she, indeed, should leave her group lol It's the best for her career. She is really pretty and she has a few good solo activities going on, but you're right. Depending on how far she wants to go, she's going to have to leave the group, because the rest of REV. from DVL will be pretty hard to pull up from what I've seen. In any case I believe solo work will suit her best. She could have a extensive career if it took off and I believe she would be quite out of place in HKT. and for all the issues discussed here.. I think that is the "beauty" of local idol groups..we don't know where we'll find a "diamond in a rough" and to imagine there's probably dozens, maybe hundreds of them out there throughout Japan..
Tokyo Idol Matsuri is the good spot to discovers all these underground idols..
and about her joining 48G.. I loves the ideas!! I'm completely fine with this, even Yuko (Doll's Vox, Takamizawa produce) and Miorin already been into a some sort of idol group before joining 48G.. But I'm not sure the circumstances now within the 48 is appropriate for her to gain her "big break"..especially in HKT..
say this..Imagine if she joined 4th Gen audition and passed..all the attention will going to directed at her, and all the buzz surrounding the 3rd Gen Kids might died out a little before they even get their "ground" stable a.k.a "Haste Pushing"..which is not good for HKT, especially when they still regained their ground after shuffles. 48G management might not even want someone who already has a name, even if she passes the audition, there is no guarantee she will be pushed/supported in HKT... She would have to re-start her career from scratch if she auditioned for HKT now! ^ Names is fine, since no matter how huge her name is, she still considered as a "Local Idol"..It's just thanks for Internet that promoted and marketed her.. But the same cannot be said if some agency marketed her and promoted her under their contracts..
and she might have to change her name too like Nakayama Nana..who was the former H!P members.. Some of her photos that I managed to find.. I dunno, I think joining 48G (or another group) may be a bad idea since there's no guarantee she'll get pushed to the front. Plenty of experienced girls get easily sidelined to push fresh faced amateurs. Besides that, I see groups more for girls that aren't ready to (or simply can't) make it on their own. If she's causing this much commotion already while being part of an unpopular group, she should go solo. We're seriously lacking right now in the Masuda Seiko, Matsuura Aya, Goto Maki department. Edit: And their official site looks better now. They also have new profile pictures for the members. "Love -arigatou-" will be released in April 16 in 6 types. Hope it sells well! Lol, I'm the 531st subscriber of Rev.from DVL公式チャンネル YT Channel? So few, but again its only been 3 days old, however, they fail to capitalize to the publicity Kanna has generated, they should fire their online marketeer! Anyway, here's the CDJapan single link. Notice the newly designed website of CDJapan, I just notice it this morning. Its just two versions just like the good old AKB days, I miss those and so does my wallet! Hmm.. anyone here have scans of Anan magazine, the one I posted above with Kanna in the front page. I've been wondering if I should get a copy but reluctant since I've regretted buying magazines with so few pages of the artist I want to see. This MV has an even worse screentime distribution than AKB48. Too bad she didn't applied for HKT48! I would have preferred Hashimoto in HKT48, but hey, it's not up to me. Good luck to them, hope their singles will improve, this one sounds like a typical average idol song. I don't know much about Kanna, but yesterday I was out with some (Japanese) coworkers and she came up in conversation. First they were talking about someone they knew who likes SKE48 (and trying to figure out what the SKE stood for, lol) and then, on the topic of idols, someone mentioned a "once in a thousand years" idol that was getting popular. I think she was on TV or in the news or something, but most of my coworkers seemed to have heard of her and how cute/beautiful she's supposed to be. They also knew that she was from Fukuoka (I live about an hour and a half away by train). They didn't know her name though and honestly I couldn't remember until I looked it up later, but I'm positive that they were talking about Kanna. So I guess she's actually known to some of the general public (since as far as I know none of my coworkers are into idols), even outside of Fukuoka. I thought someone might be interested to know that, since I was pretty surprised. I think that if she can continue capitalizing on her "once in a thousand years" image she could be pretty successful, but as others have said, it seems like a solo career might be better for her. If she's bound by a contract I doubt her current management would be willing to let her leave though. The song is old, they've been performing it for a while now, but this is the official release. I think it's similiar to other local/small idol groups, that they have some songs, and once they have their 'breakthrough' they release that as a single first. The full PV is more balanced. I find it funny how people say Kanna&the backdancers, when Kanna was a backdancer before this inet fame herself. Looking at old videos, she's not holding a microphone, the older girls do, who btw too get good portion of screentime. edit: Also, they all get blogs from now on, but not many have posted yet. i am surprised idol would come up in conversation. Somebody care to say what this job is about? Sounds monthly something show? She says she'll come back next month at the end. Is Ai ni Kinshai a B-side song of their upcoming release?